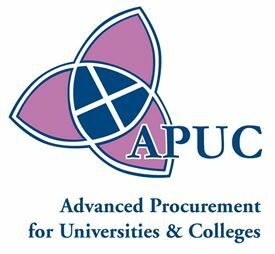 APUC (Advanced Procurement for Universities and Colleges) Limited is the procurement centre of expertise for all of Scotland universities and colleges. It is a private limited company, owned by its client institutions and established in response to the McClelland Report: 'Review of Public Procurement in Scotland', which made recommendations for public procurement reform. Operational Procurement - Collaborative Contracting Managing and delivering a wide ranging contracting plan in line with client institutions' needs, informed by an account management approach, user intelligence groups and the sectors' Procurement Strategy Groups. Development and Sustainability including Policy and Best Practice - Managing developments in processes, legislation and policy, disseminating best practice information and facilitating procurement training for client institutions. Ongoing management of APUC's Sustainable Procurement development programme, its trainee management programme and management of strategic projects. Institutional Procurement Services - Providing client management services for institutions including tendering project management for high value / above EU threshold tenders, procurement process and development support and assistance in implementation of framework agreements. eSolutions - Facilitating e procurement implementations and ongoing support. Managing information to underpin benefits tracking and reporting to Scottish Government. Supporting use of the Public Contracts Scotland portal, Scottish Procurement Information Hub and Best Practice Indicators. APUC's core vision is "to work jointly, as one team with client institutions, to maximise the contribution that advanced procurement makes to Scotland's investment in teaching, research and knowledge transfer such that institutions can deliver more with the funds that they have available". Due to internal career advancement, we are now recruiting for an experienced procurement professional to operate as the operational procurement manager for a number of UHI Institutions in the West Highlands and Islands. Get the latest jobs from APUC sent direct to your inbox!